Q: What is your current role at your organization? A: Manager of Public Relations, Office Depot. In my role, I focus on developing messaging, materials and programs to highlight Office Depot’s environmental initiatives to a variety of stakeholders, including media, associates and customers. Some examples include Office Depot’s annual Corporate Citizenship Report (www.officedepot.com/corporatecitizenship ), the Environmental Website (www.officedepot.com/environment ) and press materials (available at http://mediarelations.officedepot.cc/environment and http://socialpressofficedepot.com/environmental-initiatives/ ). Q: What green / sustainability-related project are you working on now that you are most proud of? A. In recognition of the 40th anniversary of Earth Day on April 22, 2010, Office Depot joined with the Greater Miami Chamber of Commerce to launch the Office Depot “Green Office Makeover Contest.” With the contest, Office Depot was looking to identify and reward the businesses taking actions to be green. Entrants were asked to submit an official entry with essays related to their achievements in the area of environmental sustainability. We received a number of entries from small and medium sized businesses (Office Depot’s primary customer base) in the South Florida market and utilized a judging panel to choose a winner and two runners-up. The winner of the Office Depot Green Office Makeover Contest received a prize package worth over $4,000, including greener office furniture, technology, supplies, and a consultation with Office Depot’s Director of Environmental Strategy. This program garnered local and national attention and did a fantastic job to highlight what businesses are doing and can do to reduce their environmental footprints and save money at the same time. Office Depot received feedback from chambers and other organizations across the country hoping to roll-out the program with their respective constituents – and we are looking to do just that! Q: What advice would you give others in your position trying to make a difference for the environment? A: It is critical that professionals in the communications field are aware of what their companies are doing to be green first and foremost. 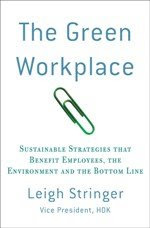 At Office Depot, I spend a significant amount of time talking about how Office Depot is implementing green practices in our own operations (i.e. building LEED certified stores, piloting fuel-efficient vehicles for deliveries, purchasing and using recycled paper and other supplies in our facilities, etc.) Once it is clear that Office Depot is taking the steps to increasingly buy green and be green, we can talk about how we are selling green to our customers…and how we can help them be green (and of course save green)! Some of those latter conversations incorporate Office Depot’s selection of 9,200 products with environmental attributes, variety of environmental solutions (tech recycling, ink and toner cartridge recycling, tech trade-in, etc), and our catalog of green products (The Green Book). Customers can learn more at www.officedepot.com/greeneroffice . Walking & Biking...It's for Real! What if there were no air conditioning?